With the development of global economy and re-urbanization, how to better apply intelligent transport with an environmental protection insight becomes a common focus. “Go Green” as the new theme of this year’s EICMA, has encouraged a number of exhibitors in rolling out the latest electric or gas-electric hybrid motorcycles and scooters. Airwheel made an eye-catching debut on EICMA with its innovative intelligent electric scooters designed for the latest theme of “intelligent transport” and “eco-friendly transport”. Airwheel since its establishment has been dedicated to the development of global green intelligent transport industry and has launched 3 series of intelligent electric scooters in consistence with current demands of urban commute and environmental protection. 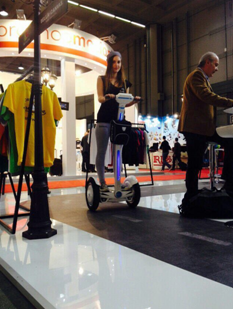 It is reported that Airwheel took a leading position of annual sales volume 2014 in the intelligent scooter industry. 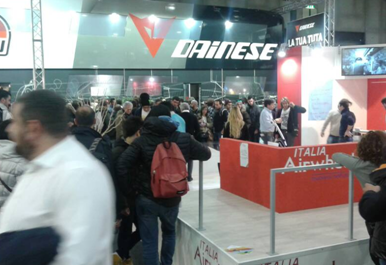 During the exhibition, the trial session of Airwheel X-series, Q-series and S-series attracted many visitors for a go. Among all the high-tech models, Airwheel S3 is the latest and most popular one. It is a 2-wheeled self-balancing scooter based on Dynamic Stabilization i.e. self-balance theory. The motion and attitude of Airwheel S3 is determined by a build-in Solid-State Gyroscope which calculates specific directives by a precise micro CPU to drive a hub motor to achieve dynamic balance. Airwheel S3 is highlighted by a 4in human-machine interface (HMI), LED atmosphere lights and a Bluetooth audio system to tune in your trip. Thanks to Airwheel’s R&D engineers, S3 features an optimized balancing system. You can simply control the scooter to go forward, backward and make turns by shifting center of gravity. In addition, the riders’ safety is guaranteed by quadruple protection measures i.e. speeding protection, tilting protection, low battery protection and sound alert. About Airwheel Technology Co., Ltd.
Airwheel Technology has years’ of rich experience in electric intelligent scooter industry, Airwheel boasts premium recognition, leading market share and increasing popularity among fans. Driven by a top intelligent chip and powered by a Sony Li-ion battery, Airwheel intelligent scooter is well received by 2 million customers all over the world, and its market is still expanding at an amazing speed.